The ‘Rocky’ films continue to inspire, to move, to get the blood pumping, to even force us to shed a tear; and perhaps they will never stop doing so. The undisputed best when it comes to the longest running, most consistently thrilling series of films devoted to boxing, the ‘Rocky’ saga captured our hearts and minds and, like a desperate fighter’s clinch, it will never let us go. The ‘Rocky’ films have their critics, of course – they are too “over the top,” too “cringe-worthily melodramatic” and too “unrealistic,” so say these critics, amongst other things. But one of the often overlooked ingredients of the films – all six of them (not including the two high quality spin-offs) – is the fact that so many real life boxers appear along the way. 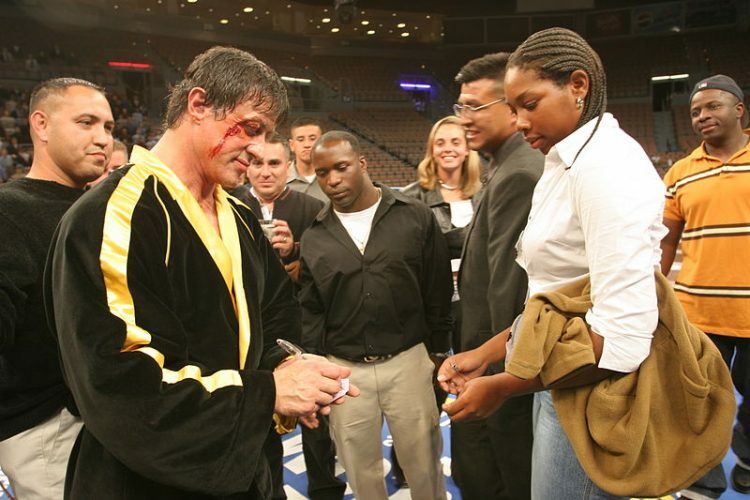 We have read over the years how so many real life fighters got their own inspiration from watching one or more of the films, and a number of greats actually appeared alongside Sylvester Stallone throughout the 40-year saga. For the purposes of a fun article and nothing more, listed below are all real life fighters to have appeared in the ‘Rocky’ films, with all 11 of them ranked in order of greatness. Real life achievements in the ring: Won world titles at 135/147/154 and 160 pounds. Referred to by many as THE finest lightweight boxer of all-time. Quite a coup for Stallone and co to acquire Duran’s services in 1979. Real life achievements in the ring: Won the undisputed heavyweight championship of the world and ruled from 1971 to 1973. Contributed quite a bit to the entire ‘Rocky’ story; some even saying Joe is the real-life Rocky. Real life achievements in the ring: Was world light-heavyweight king and shocked the boxing world with his 2004 KO of Roy Jones Junior. Real life achievements in the ring: Won the WBO heavyweight title and managed upset wins over the legendary George Foreman and the lethal Donovan “Razor” Ruddock. Passed away at the far too young age of just 44. Real life achievements in the ring: Super-tough ’70s and ’80’s heavyweight contender who fought, amongst others: John Tate, Gerry Cooney, Leon Spinks and Tony Tucker. Real life achievements in the ring: Won an Olympic gold medal in 1984 and twice defeated an amateur Mike Tyson. Is a good trainer today. Real life achievements in the ring: Was a superb amateur who twice defeated the great George Foreman. As a pro, Hodges managed a win over a 2-0 Jimmy Young, being just 1-0 himself at the time. Real life achievements in the ring: “The San Fernando Hammer” was once looked at as a real threat to the world title. Managed wins over Mike White, Ossie Ocasio and Jerry Jones. Also fought Joe Hipp and Buster Mathis Junior. Real life achievements in the ring: A rough and tumble fringe contender in the ’70s, Lovell managed wins over Billy Daniels and Jody Ballard. Also fought Ken Norton, Leroy Jones and Mike Weaver. Real life achievements in the ring: Burton went 4-3-1(2) as a pro heavyweight in the late ’50s; his most high profile fight being a KO loss to a 39-0 LaMar Clark.